The first week of school is a busy time for our lab, and my to-do list is miles long. Lunch is eaten with one hand, as the other is reserved for responding to emails. The easy-going summer days are truly winding down, but I love the transition into autumn. The once humid air becomes cool and crisp, and the chameleon-like green leaves change to rich shades of red, orange, and yellow. They fall and scatter on the streets like sprinkles on a cupcake. In a blink of an eye, they completely vanish and soon the ground is delicately covered with pure white snow. I feel like I live in a fairytale land. The other morning I woke up thinking about my next recipe, and every sign was like a not-so-subliminal message pointing to burgers. Football season just started (I am only cognizant of this because of the proud shouting New Englanders last Thursday night), and burgers are a staple food during this high-testosterone season. With school back in session, a big juicy burger reminds me of my dear alma mater. My college town was home to Burgers & Brew – everyone’s favorite place to put food in their stomachs at 2:30 AM on a Saturday night. But like the other senior citizens, I was usually in and out of there by 6pm. 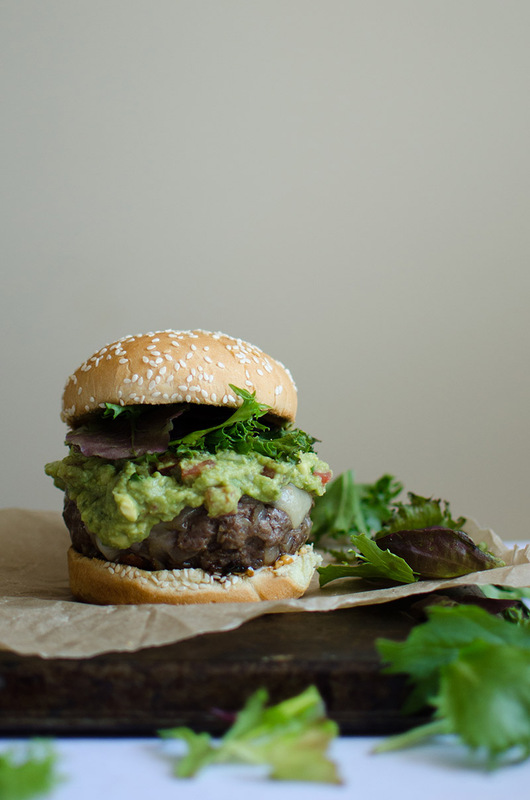 The burger that always sang to me was the spicy guacamole burger. It was incredibly rich and succulent. The ground beef is seasoned with salt and pepper. I sauteed onions and garlic and mixed it in with the ground beef, then I gently formed four hefty patties. The spicy guacamole is heavily adapted from Alton Brown’s fantastic recipe, and the jalapeno mayo is slightly adapted from Emeril’s recipe. Searing meat on a hot grill (pan) is incredibly satisfying. Now the rule of thumb for searing meat is not to move it once you’ve placed it over the heat, otherwise Francis Mallmann will have a heart attack. 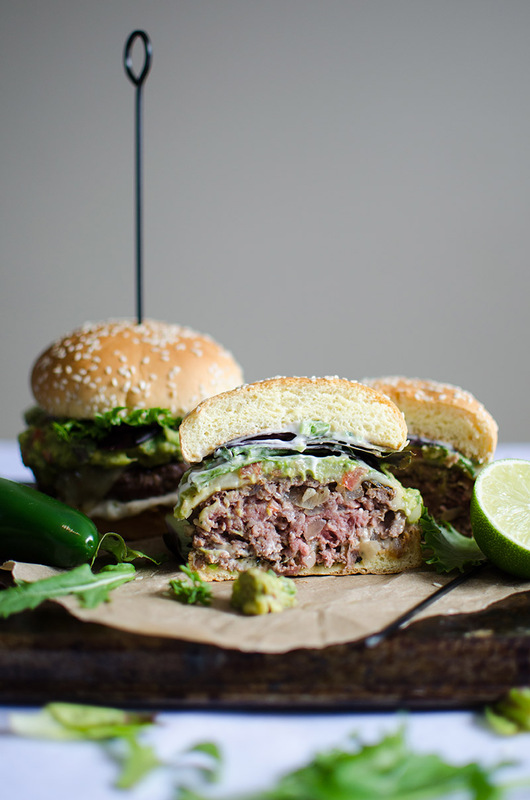 Let the patties sear until they’re crispy on the outside, but juicy and tender on the inside. This is also known as medium-rare. 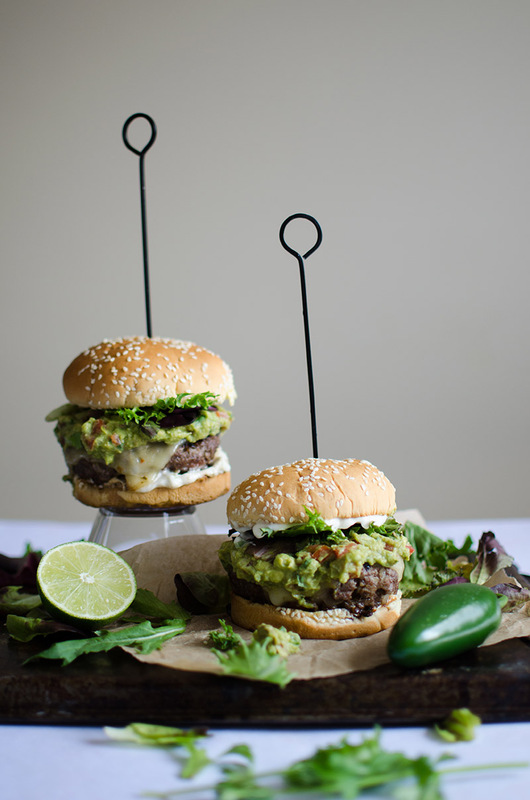 The soft guacamole and the seared beef patty, held together by toasty buns with jalapeno mayo, are simply divine. I don’t recommend wearing your ball gown while consuming one of these burgers – it can get pretty messy. These burgers remind me of simple college days, when I would putter around campus on my bike and eagerly take notes (with colored pens to coordinate!) during lectures. I never feel far away from those glorious college memories with these amazing burgers. Wishing you all a wonderful school year, football season, and happy days until Thanksgiving rolls around! 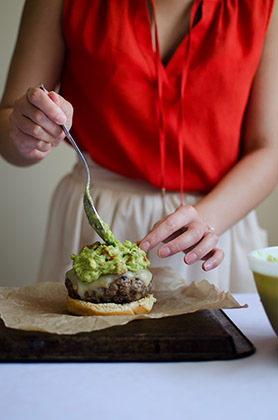 In a medium size bowl, mash the avocados with lime juice, salt, cumin, and cayenne. Stir in the jalapeno, tomatoes, cilantro, and garlic. Cover and set aside. Mix all the ingredients together in a small bowl, then set aside. In a medium skillet, heat up ½ tablespoon extra virgin olive oil over medium heat. When the oil is hot, add the onions and cook for 2 minutes, stirring occasionally. Add the garlic, then cook for another 3 minutes, until the onions are soft and translucent. Remove from the heat, then set aside to cool (about 20 minutes). In a medium mixing bowl, mix together the ground beef, salt, pepper, and cooled onion mixture with your hands. Form four round patties (make the patties slightly larger than your buns), then set aside on wax paper. Heat a grill pan or a skillet over medium heat. If you're using a skillet, add 1 tablespoon extra virgin olive oil. Cook the patties on one side for 5-6 minutes for medium-rare. Flip the patties, then top each patty with a slice of pepper jack cheese and cook for another 5-6 minutes (or until desired doneness). Place the buns, cut side down, onto a clean skillet or grill pan over medium heat. Toast for 30 seconds, until slightly golden brown. 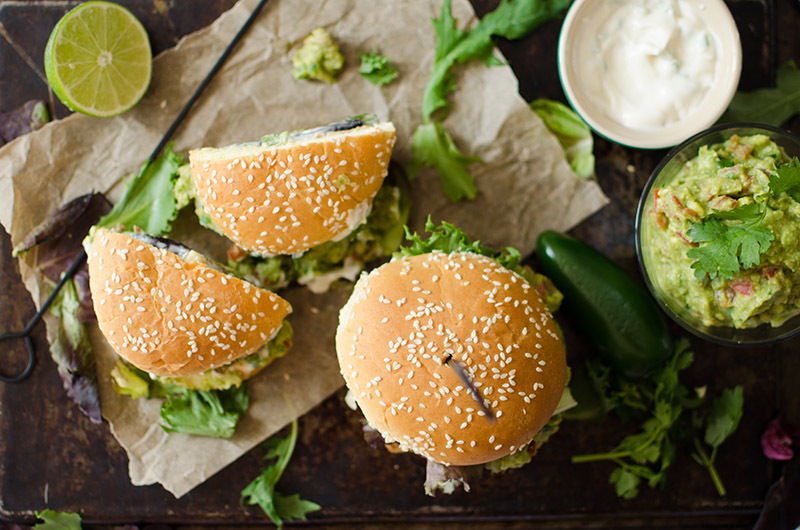 Spread the jalapeno mayo on each toasted bun. 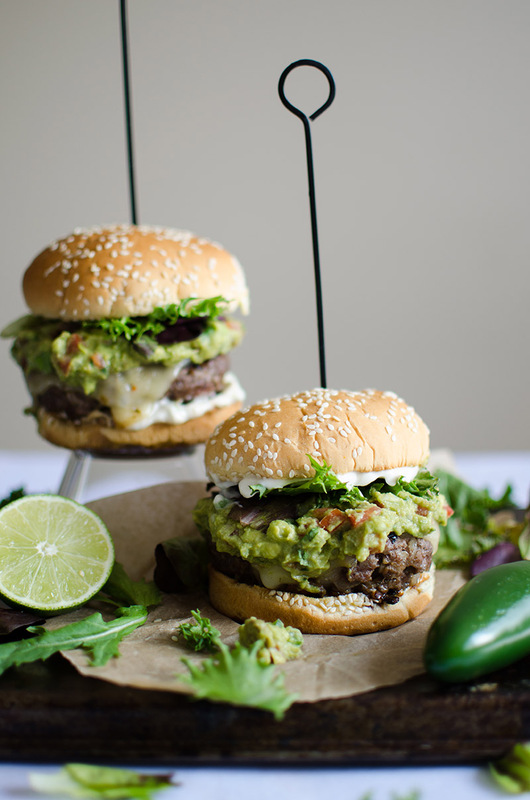 Top the bottom buns with a patty, then add one or two spoonfuls of guacamole on top. 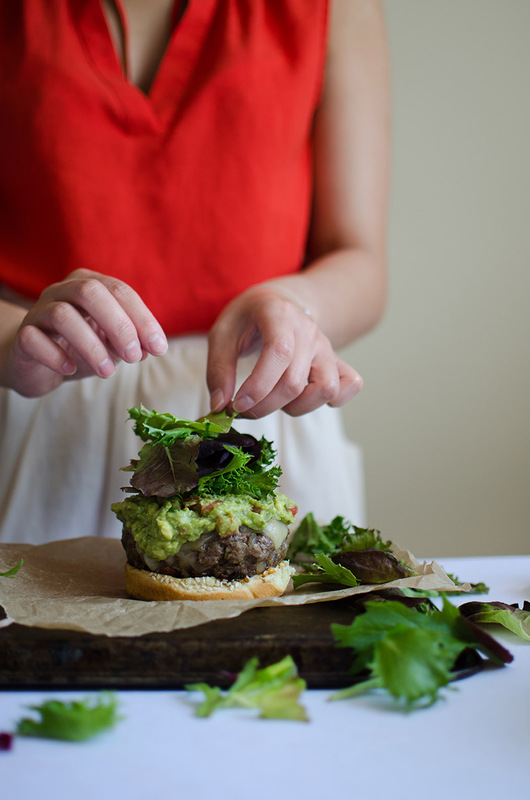 Top with a handful of spring mix and the top bun. 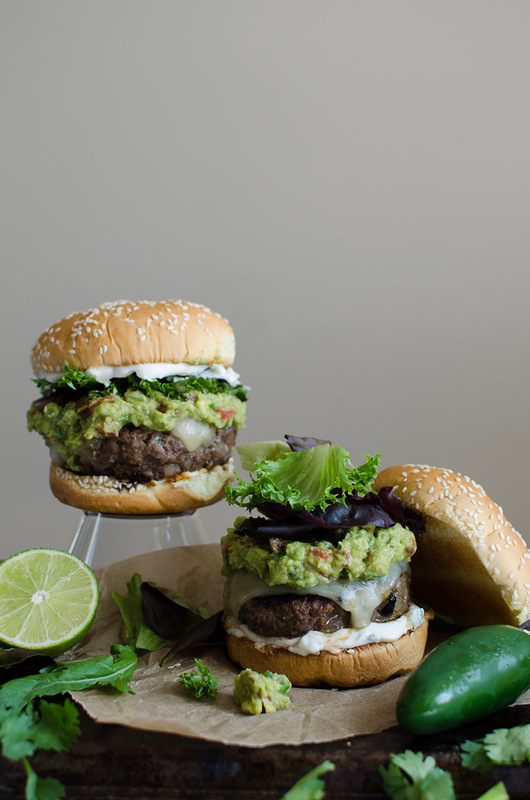 This entry was posted in Entrees and tagged burger, cilantro, cumin, ground beef, guacamole, jalapeno, lime juice, mayonnaise, pepper jack cheese, spring mix. Sounds fantastic. Something new to try. Thanks. 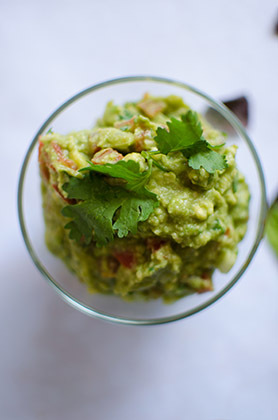 Guacamole is a great topping on just about anything! Yummy burger!